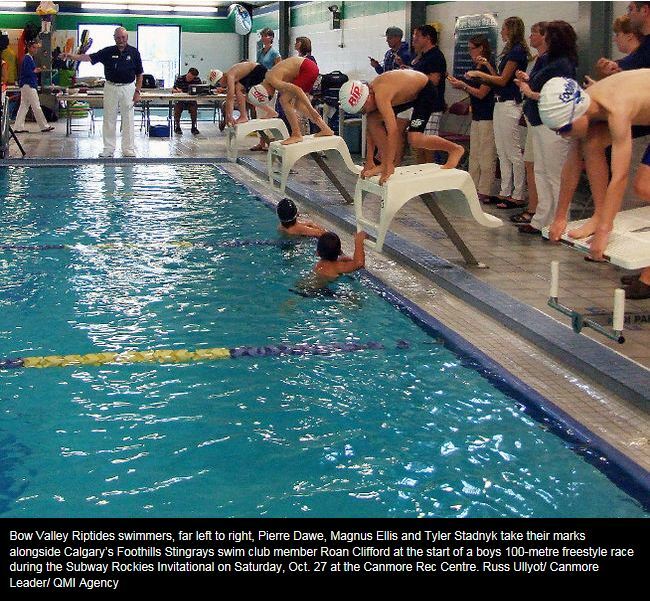 The Riptides hosted the Cochrane Comets, Foothills Stingrays, Cranbrook Tritons and Columbia Valley Otters in the first meet of the season. Neo Gleason led the boys with five 1st place finishes and one 2nd, combining with Alex Neilson, and Aidan and Sean Parker for the win in the 11-12 boys 200 free relay. Avi Lamb led the girls with two 1st place finishes, three 2nd place ribbons, and one 3rd, combining with Emily Titus, Ryan Gooch and Kassandra Shepherd for second in the 9-10 girls 200 free relay. Congrats to Cassidy Behm on breaking the girls 10 & Under 25m Fly record with a time of 21.05. Updated records found here. The event was featured in the Canmore Leader and Rocky Mountain Outlook.